The Travel Agent Next Door (TTAND) has been named Partner of the Year for Canada by Royal Caribbean International (RCI). “We are extremely proud to award The Travel Agent Next Door with our prestigious Partner of the Year for Canada. This award is only presented to one account each year and we always look for something special and unique in an account overall and how they step out to drive business,” said Lisa Connell, director of sales, Canada, RCI. 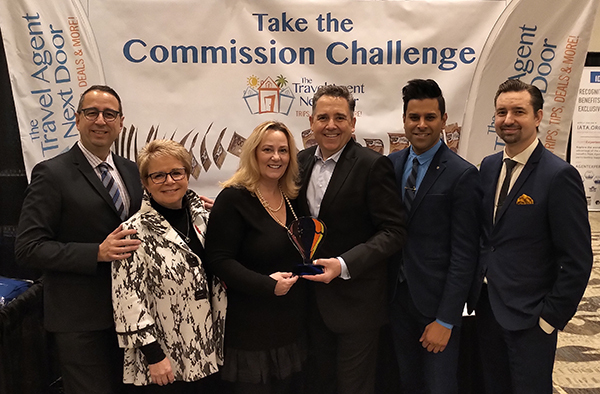 Photo (L-R): Eric St-Pierre, RCI national accounts manager, Canada; Rhonda Friisdahl, TTAND; Lisa Connell, RCI director of sales, Canada; Flemming Friisdahl, founder, TTAND; Shane Buksh & Colin Price, RCI strategic account managers.